Turning 180 degrees from this view gives us a view of the main entrance. There's the 3,000-year-old Flaminian Obelisk, on a pedestal embellished by lions spouting water from their mouths, in the center of the piazza, behind which you can see the main gate. It's not nearly as big as I thought it would be, but I guess to folks who had never seen anything bigger than a town church it would be impressive. Funny, because many other things in Rome are built on a grand scale. Just to the right of the gate (as we're seeing it from this vantage point) is the Chiesa del (Church of) Santa Maria del Popolo. From an art history point of view, this is one of the more important Roman churches. Much of the interior was decorated by Pinturicchio, including a series of mosaics along the apse ceiling. The Chigi Chapel was designed by Raphael and completed by Bernini. At the far end of the church are two dark alcoves. Dropping spare change into a mechanism turns on several cheap lighting fixtures, after which you can see two Caravaggios. (None of the other tourists seemed to know these masterpieces were here.) At left is The Crucifixion of St. Peter, realistic, including dirt on the saint's feet and an unpleasant facial expression appropriate to the event. 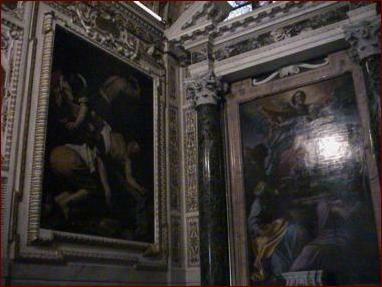 At right is The Conversion of St. Paul, which captures the saint's state of mind at a crucial moment in his spiritual maturity. We leave the church and head toward the hill, the Villa Borghese. We take several footpaths, with some steep switchbacks. It's an unseasonably hot morning, and there are good views of buildings, statues, and cityscapes; it takes us a few minutes to make our way uphill. Isaac has a great time hiding behind the statues we encounter along the way. As we get to the top of the rise we see gargoyles and griffins on the roof of a building by which we just walked. A few more steps and we come across a good vantage point of the Piazza del Popolo. Looking down from the vantage point I see a group of nuns on their way. We saw a lot of Roman Catholic clergy around the city, and a smaller number of Jesuits. We also visited the synagogue, but that's a story for another page. We walk along well-manicured paths, under the spreading arms of huge trees, until we come across one of two water-clocks to be found in Rome. (The other one, no longer functioning, may be found in the courtyard of Via del Gesu 62.) This clock, still functioning, was constructed by Giambattista Embriaco (frate Domenicano) in 1867. It's an amazing work of art and science; highly recommended. Isaac had a great time in the Villa Borghese. He loved the tree-lined paths and the friendly, well-dressed people on bicycle. Piles of leaves beg for a small child to jump all over them; these were satisfied :-) A particularly large leaf became a hat. We had a delightful lunch at the café in the park; amatriciana is hard to screw up even for those with a limited kitchen. After lunch we strolled around, crossing the Viale del Muro Torto, looking at the gazebos and reconstructions of ancient buildings. We made it to the Piazza di Siena, an oval racetrack kind of thing, before we turned south. Because it was a weekday, and during the off season, we had the park pretty much to ourselves. The sun was setting, giving us beautiful streaked skies and cool shadows at our feet. A peaceful way to end a walkabout. Soon we were at the Porta Pinciana, one of the gateways through the old city wall. These days it has four lanes of automotive traffic going through its portals.with I'm very impressed at the seemingly good condition of the walls, what with all the pollution eating away at ancient stoneworks. Through the Porta Pinciana lies the Via Veneto, the very-high-rent district, with posh hotels and restaurants. I'm reminded of the streets near Manhattan's Fifth Avenue or Central Park South, perhaps a bit of Paris' Champs-Elysées, or Boston's Beacon Hill. Very nice for a short time, but no intrinsic beauty other than the conspicuous consumption of consumer services. The kind of neighborhood where one can get a great lobster bisque, for $20 :-) Pictures of Woody Allen, Sylvester Stallone, etc. line the windows of some restaurants. It's not how we choose our dining places, but whatever works for others. We make it to the Piazza Barberini and split off from the others; their other jobs becon. We decide to contine trapsing around, to enjoy Roma after dusk. We find some old stairs and begin climbing. The roadway is right against the steps, so Isaac gets excited by the cars whizzing downhill a few feet away. We reach the plateau and see a dark piazza with a brightly-lit building across the way. We walk across it, Isaac leading the way, when I notice several small police cars near the entrance and two police motorcycles on the street. As I walk to an officer a black car drives in front of us, to the street, escorted by the motorcyles. It was the Italian president, leaving the Palazzo Barberini, the president's residence. The Pope in the morning, the president in the evening. Quite a day.